In preparation of the first draft of the speech he had asked his aide Ted Sorensen, to study Abraham Lincoln’s Gettysburg address to "discover its secret". They found that Lincoln’s speech was short, focused on the central theme of honouring sacrifice in the cause of liberty, and used simple clear language. Thurston Clarke also examines the rhythm and sentence structure of the speech, which gives it style and consistency. "Let us never negotiate out of fear. But let us never fear to negotiate." "The trumpet summons us again – not as a call to bear arms, though arms we need – not as a call to battle, though embattled we are." "Ask not what your country can do for you, but what you can do for your country." This speech was not an assembly of soundbites, but a powerful single piece of work. David Cameron’s speech in Blackpool has been compared to this speech because of certain similarities of language. Cameron cried "So let the message go out from this conference", and exhorted the values of a "new generation of Conservatives". However an examination of his speech shows more than passing resemblance. There has been much talk of ‘Camelot’ since David Cameron’s election as leader of the Conservative Party. However, the comparisons started the day after he gave ‘that speech' at the 2005 Blackpool party conference, which seemed to echo with President John F Kennedy’s inaugural address on 20th January 1961. The importance of the big speech is something that has never been lost on the great communicators of modern politics. Presidents Reagan and Kennedy, like Winston Churchill, were great speakers because they invested a great deal of time and care in their performances, and had honed them over years. This great care, rather than being evidence of an interest in style over substance, is rather evidence of great respect for the people they are speaking out to, and a desire to make sure their message was both inspiring and understood. 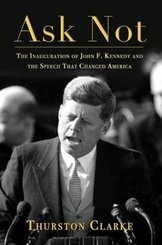 John F Kennedy’s preparation of his inaugural address has received detailed analysis by the New York journalist and historian Thurston Clarke, in “'Ask Not' - the Inauguration of John F Kennedy and the speech that changed America". Clarke writes about the final crafting of the speech and the consideration of its staging in the 10 days before the inauguration. This account is not only written with pace and energy but provides a window into the way Kennedy worked, and how he was trying to present himself and his Presidency. Anyone interested in the Kennedy Presidency will enjoy the care and detail in Clarke’s work, but anyone interested in politics will be intrigued by the how they went about trying to construct a great speech. They both used emphatic synonymous repetition to emphasise key points and create a rhythm through the speech. For example Kennedy states in his speech, "All this will not be finished in the first one hundred days. Nor will it be finished in the first one thousand days, nor in the life of this Administration, nor even perhaps in our lifetime on this planet. But let us begin." And David Cameron “Let's not blame the electoral system. Let's not take comfort in solid, but slow progress. Let's have the courage to say: they've failed, but so have we." Both speeches focus on a simple theme - Kennedy’s that each generation of Americans must uphold and extend the cause of liberty. Cameron’s that it is time for a new generation of Conservatives to change the party so it can change Britain. Both draw their speeches to a key moment – Kennedy’s famous "Ask not what your country can do for you, ask what you can do for your country’, line and Cameron’s, "Modern Compassionate Conservatism is right for our times, right for our party - and right for our country". They create a consistency in framing key messages in the speech. For example Kennedy addresses America’s commitment to working for peace with the Soviets – "So let us begin anew….Let both sides explore…Let both sides…formulate….Let both sides seek….Let both sides unite." And Cameron calling for the party to move forward - "So let's build together a new generation of Conservatives. Let's switch a new generation on to Conservative ideas. Let's dream a new generation of Conservative dreams." They are both relatively short by modern standards. Kennedy’s speech was 1,366 words long and David Cameron’s speech just over 1,700. This compares to Tony Blair’s speech at the Labour conference in Brighton, which was over 5,400 words long. And in both cases great care was also given to the presentation of the speech. Speaking outdoors in the cold, snow covered Washington winter, Kennedy distinguished himself from the men of the previous generation by not wearing an overcoat and but thermals instead so he looked more vigorous. Cameron’s vigour came from speaking without podium or notes. Jackie Kennedy wore a white overcoat so that she would be picked out on film against the men and women in uniformly dark coats. Coincidentally Samantha Cameron also stood out in a white coat against the men dark suits, when she stood on the stage for photographs with her husband when he was elected leader of the party on 6th December 2005. But all of this is of academic interest. The Kennedy speech was great because it inspired a generation, and set the tone for a new type of Presidency – ambitious, hopeful and vigorous. David Cameron’s speech was so highly regarded because it blew open a stuttering leadership contest, and gave an instant vision of what a renewed Conservative Party could be like, and what it could achieve. The lesson from Thurston Clarke’s book is, ask not why successful leaders believe communicating their message well is so important, but question those who don’t. Damian Collins is Managing Director of Influence Communications, at M&C Saatchi, and was the Conservative candidate for Northampton North at the 2005 general election. "Mr Gove said that the party should have a dynamic CEO surrounded by sage advisors. Mr Gove invited us to look across the Atlantic and remember how the youthful John F Kennedy and Bill Clinton surrounded themselves with elder statesmen of their day." I wonder if Lloyd Bensen would have been kinder to David Cameron than to Dan Quayle in his famous quote?